Potty training is sometimes a frustrating and confusing experience, perhaps more so for us parents than for our children. Among the toilet training challenges that you might be dealing with is a child who, despite using the potty regularly at home and in public, refuses to use it at day care or school. Shyness can make it hard for your child to feel comfortable approaching a staff member at her day care for assistance. There may be something about the nursery's bathroom your child doesn't like, and this is causing anxiety. He might be afraid of having an accident at school so he feels more secure in diapers. The bad news is that at this stage of development, your child's limited vocabulary may make it impossible for him to tell you what's wrong (and he may not really know what is causing him to resist using the toilet anyway). The good news is that you might be able to help him by offering lots of positive reinforcement and trying different strategies one-by-one that address the possible causes for his resistance. It's unlikely that he will change his mind about the potty overnight, however. This will take time and a lot of patience from you and your toddler's caregiver. The most important thing when dealing with a shy child is to avoid dismissing his fears or ridiculing his shyness. Statements that demand he "stop" being shy are just going to make him more self-conscious. If shyness is at play in potty training at school, it was probably a factor in other milestones there as well. How did your caregiver help your son feel at ease when you first left him? How did she get him to interact with other children? Some of those same strategies might be applied to this situation. At the very least, the staff should make an effort to ask him if he wants to use the potty rather than waiting for him to approach them. An experienced caregiver can often recognize the signs of a child with a full bladder or knows that a child is ready a little while after eating and drinking. And if he doesn't want anyone to go with him, the staff needs to be sure that the bathroom is set up in a way to make it easy for him to go on his own. It also helps to dress your child in clothes that he can pull up and down himself (elastic waistbands, no belts, etc.). Bringing his own potty to at school can be an excellent way to make your child feel more comfortable. 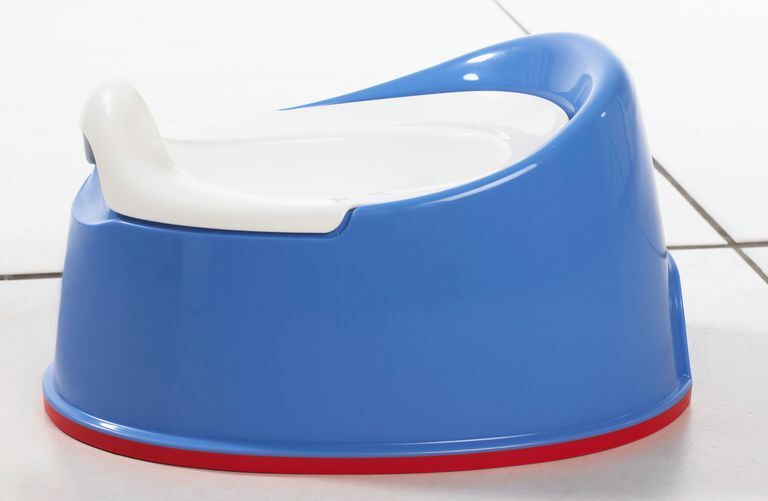 Even if he resists using it at first, you can continue to keep it at the nursery school so that when he is ready to try, he has the added comfort of using a potty seat that is comfortable and familiar. If you suspect that your child is not just shy but seems afraid (mildly or severely so) of using the potty at school, it's important to hunt down the reason. Toddlers and even preschoolers seem to make up their own "rules" and stories around everyday rituals. Part of this has to do with what's called magical thinking, which is the same phenomenon that makes a two-year-old insist on only using a pink spoon (because food won't taste as good with another utensil) or results in her refusing baths since she is quite certain that children can disappear down that drain. If your toddler is adamant about not using the daycare potty, she may have built a connection in her mind between that potty and something unpleasant. Before you consider flights of fancy, though, consider whether there are real and concrete reasons she doesn't want to use the potty. Look around the bathroom at your child's nursery school. Is there a picture on the wall that she might not like? Is it too dark? My own daughter once refused to use the potty at a daycare center because it "smelled funny" (the air freshener was very strong and she's sensitive to odors). Again, your child's limited vocabulary may make it hard for him to tell you what's wrong, but if you suspect something, you can point it out to him and observe his reaction. The cause of anxiety may not be physical but could be related to the different routine they use at school. Do the children use the potty in a group? Some kids might find that unsettling. What practices do you follow at home that you could have the staff adopt? Some families have a song they sing at potty time or allow a child to read on the toilet. Making those rituals part of the experience at the nursery school can go a long way to making your toddler or two-year-old feel more at ease. And don't feel that you are imposing on the staff. They surely are eager to have a well-trained child in their care and should be willing to do what it takes to help him progress. Another reason your child may not want to be one of the potty users at nursery school is that he doesn't like what happens when "those kids" have an accident. Ask the staff what their procedures are when a child wets or has a bowel movement in her pants. If you think that they are using inappropriate toilet training techniques, you should address that with the daycare director. You can also ask your child what she has seen happen. Perhaps he's noticed a child cry after an accident, doesn't want to be the focus of attention, or just wants to avoid being the one to soil the carpet. In this case, you might want to see if you can compromise with your son: he can wear absorbent training pants like Pull-Ups "just in case" but needs to try and use the toilet when he has to go. Every setting is different, but if your child is showing signs of potty training readiness but none of their peers are toilet trained, there might be little motivation for her to go to the toilet even if they're capable. And even worse, you might also be dealing with an unsupportive caregiver who feels like it's easier to have all the two-year-olds on the same page. Address the situation head on by reinforcing your expectations and praising your child for not needing diapers any longer. Also be clear with your caregiver that you won't allow your child to wear diapers during the day. Using reinforcements like a sticker chart can also help a child see that being a "big kid" is special. As with everything related to raising children, consistency is key. Since you know that your child is ready for the potty, it's okay to let him know that you expect him to use the potty at daycare. Be sure the staff is offering him the chance to use the potty every day and are being positive when they tell him they know he can do it. You and your child's provider need to avoid turning the potty into the focus of fights and tantrums, though. Forcing him to sit there, punishing him for refusing, or making derogatory comments will only make a willful toddler dig in and refuse more. Do You Let Your Child Pee in Public?